Enjoy your weekends on the lake instead, and let us do the work for you. We spray everything on the dock, including the roof! Our system reaches EVERY area of your dock, including the roof! 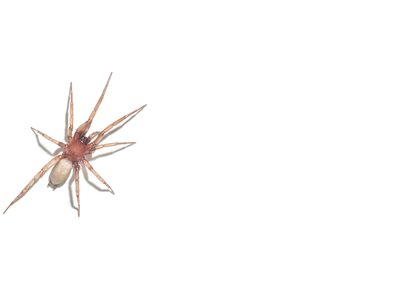 Our boat dock spider control program is a monthly pest control treatment program for your dock. We start in April and spray each month until September. We use a high-pressure sprayer to reach every part of your dock from the ramp to the swim platform. Brushes on extended poles are used to remove visible spider webs, egg sacks, and insect nests. We use a formula made of essential oils, making it completely eco-friendly, safe for your guests, your pets, children, and our environment. As pests ingest the formula it will dehydrate them (not poison them) from the inside out and prevent more bothersome pests from coming back to your dock. 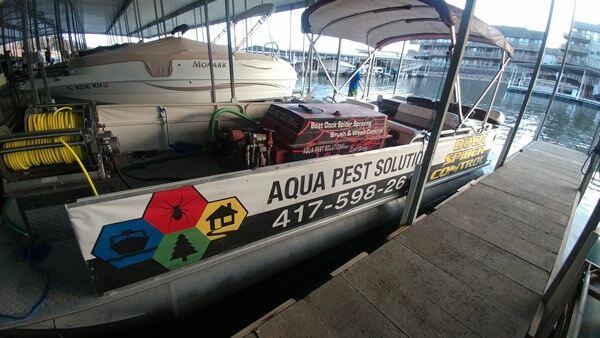 Many of our competitors offer boat dock spider control, but they use handheld sprayers and other equipment designed for homes. They simply can’t reach your entire dock with those sprayers. We use boat-mounted 800psi sprayer systems that can spray up to 100 feet into the air. There isn’t a single part of your dock that won’t be covered. Pesticides are an important part of our lives, whether we like them or not. They help protect our food, families, and homes from dangerous or damaging pests. However, pesticides can be dangerous or be damaging to people and the environment if applied incorrectly or in the wrong places (like over our natural water sources). Some pesticides can remain in our water for up to 30 years and still cause harm. That’s why we use something that’s new, but actually very old. Essential oils. Plant-based insecticides have been used for centuries to control and repel pests. Our essential oil blend is formulated with several potent, botanically derived active ingredients, including rosemary oil, Geraniol, and peppermint oil. Rosemary oil repels mosquitoes and other flying insects. Geraniol is derived from geraniums, rose and lemon plants to repel ticks, fleas, flies, and other pests. Peppermint oil kills, repels, and has larvicidal effects on a variety of insect species, especially spiders. Together, with a few other essential oils, our blend creates the ultimate boat dock spider control solution. The best part is: it’s safe for the water, aquatic life, and your pets & children.